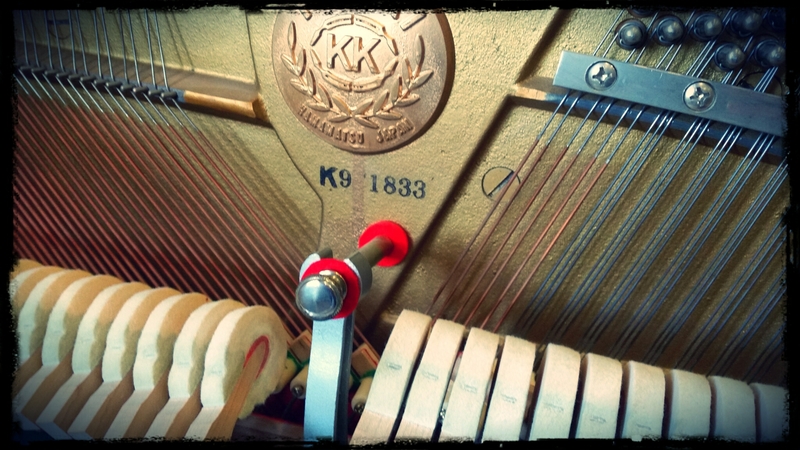 Did you know that about a third of the piano is strung with copper-wound strings? The lower notes use copper winding because the extra mass helps create lower pitches; without that extra mass, pianos would have to be 20-30 feet long just to have strings long enough for those lowest notes! Usually somewhere in the octave below middle C, pianos switch over to plain wire. On a well-designed piano, the break should hardly be noticeable. Listen for it next time you’re at a piano and see if you can tell where the break is! On this Kawai upright, the copper wound strings continue up three notes past the end of the bass bridge (the point where the angle of the strings changes). That helps make the transition even smoother. Notice also that when the switch to plain wire happens, there is a transition to three strings per note instead of two.